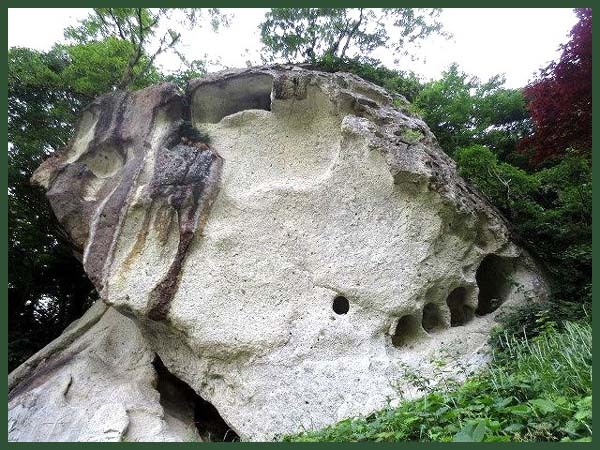 At many places, you take home some offering (a stone, branch or wart of a pine tree 松イボ) to rub on the warts till they are healed, or bring a special offering to have your prayer granted. 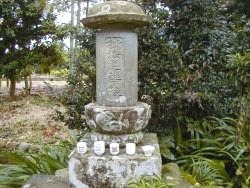 Other places offer sacred springs or wells to use the water.
. ibotori Fudo イボ取り不動尊 to take away warts . Take one of the small stones and rub in on the wart or painful part of the body until the pain is gone. In return, bring a small stone as an offering. 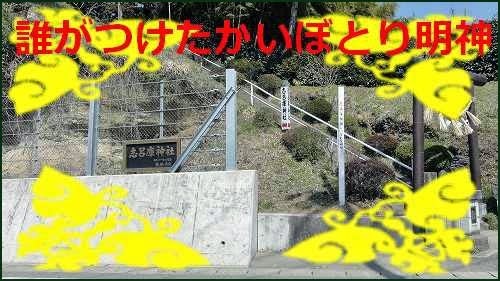 The fragrant water from the well behind 帝釈天堂 Taishaku Hall helps to heal warts.
. Taishakuten 帝釈天 Taishaku Ten . yuzu no ki Jizoo 柚の木地蔵 Jizo of the Yuzu citron. "Well, since this is a great shame, let us go to the Yuzu Jizo and pray for help." "Please take away the warts from my older sister. I do not mind if you put them onto me!" "Oh dear, that is not a good thing to say. What will you do if you get all the warts?" But after three days, all the warts had gone from the elder sister's body and began to show on the younger sister. So mother took the younger sister again to visit Yuzu Jizo and prayed again with great intensity. 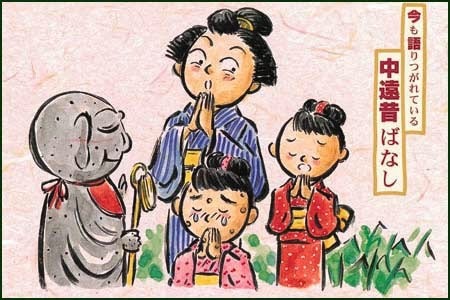 This time Jizo heared her soon and granted her prayer, taking the warts from the girl's body. 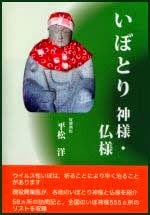 Since then the local people called the statue ibotori Jizo 疣取り地蔵. Until to our day, people come here to pray and bring flower offerings to the Jizo.
. Fukuroi no marudako　袋井の丸凧 round kite from Fukuroi . Use the water in the tea bowl before the stone marker to rub onto the wart. 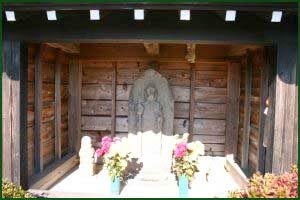 CLICK for more samples if 疣取り地蔵 ibotori Jizo Bosatsu.
. Jizo Bosatsu (Kshitigarbha) 地蔵菩薩 - Introduction .
. . . CLICK here for Photos of shrines ! 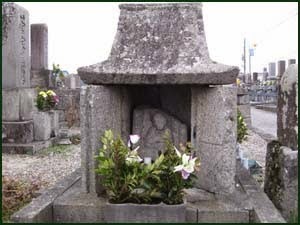 In the compound near the graveyard is a statue of いぼ神地蔵 ibogami Jizo. at Mount Happusan 破風山, 601 m high, Mount Happu, Minano, Saitama. At the temple 水潜寺 Suisen-Ji, Nr. 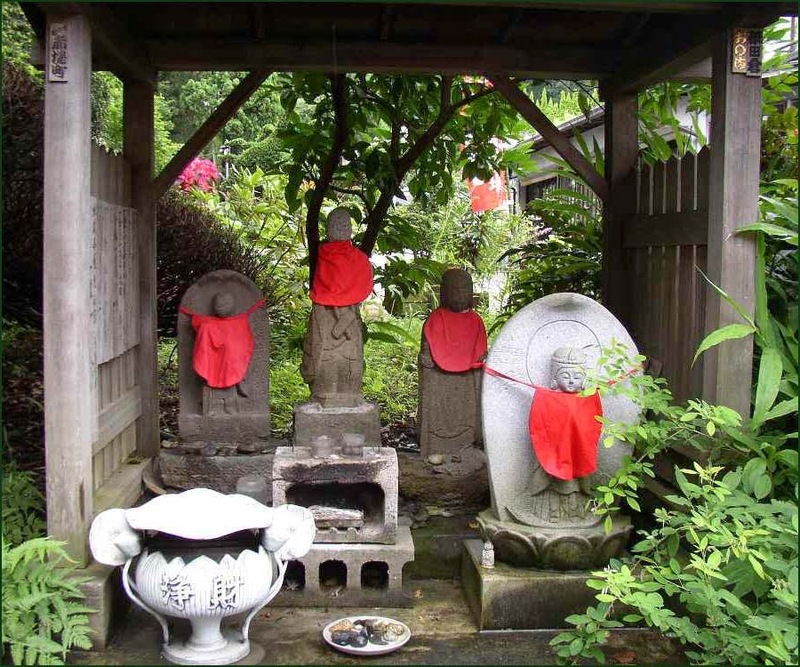 34 of the Chichibu Pilgrimage to 34 Kannon Temples, Nokkin-Bo Tengu is venerated as a protector deity. Nokkin-Bo is ibo no Kami イボの神, a deity to take away warts. The local people came here to worship, bringing some Sake rice wine in bamboo containers. Even nowadays, a lot of "Cup Sake" is offered here. People use the water offerings to spread them over their skin for healing. If they get healed, they bring some Tofu as an offering.